With the help from Basheer, Sudhir was able to make it to the UAE and both of them also shared a room in Team India’s hotel in Dubai. In the current scenario, India and Pakistan cricket teams might not be ready to play each other in any bilateral series, but India – Pakistan cricket fans have different views about bilateral goodwill and harmony. 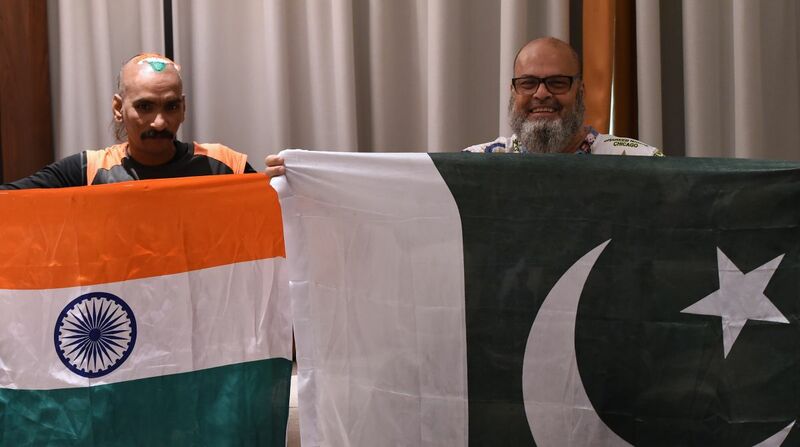 Pakistan’s Mohammad Basheer and Team India supporter Sudhir Kumar are a case in the study as the two have proven that cricket knows no boundaries and the game provides great opportunities to develop relations transcending all barriers. Mohammad Basheer, a Chicago-based Pakistani, has opened his heart as well his wallet to make sure that one Indian fan Sudhir Kumar could watch the ongoing Asia Cup 2018 in the United Arab Emirates. Sudhir Kumar, 37, who hails from Bihar, has travelled all over the world to support Team India. However, he was certain to miss the tournament in the UAE after he could not contact his idol and sponsor Sachin Tendulkar in London. Sudhir and Basheer came across each-other during the ICC World Cup 2011 and the two became firm friends. After the World Cup, both Sudhir and Basheer have been getting together at India-Pakistan matches ever since.